So, let's get started. Grab your first 16 patch block that you made in the last step. Lay it out on your mat. Don't worry to much about lining it up, it doesn't matter. Now, if you have a yard stick it will probally be easier to use. Unfortunately, I don't own one. Crazy, I know. If you don't have a yard stick use your long ruler and another ruler lined up together. Lay your ruler diagonally across your entire block. You want to try and make sure that your ruler is intersecting each of the corners. Make sure to really smooth your corners out, they will want to creep in on you :) Once you are all lined up, go ahead and cut along the diagonal. Now don't move your fabric. Go ahead and pick up your rulers or yardstick and align them along the opposite diagonal. Once again, make sure to intersect all of your points and to smooth out your corners. Honestly, a lot of times your points will be all lined up and then you will find the edge doesn't line up. Most often it just needs to be smoothed out. Once you are all lined up go ahead and slice along the diagonal. Now you can go ahead and pull your 4 parts apart. You will end up with 1 - 2 of these little scrap pieces hanging out either under your square or poking out. Go ahead and cut them off. This will help to reduce bulk making them easier to piece in future steps. 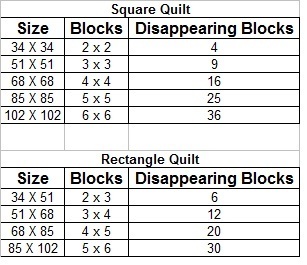 Continue this process until all of your 16 patch blocks have been cut. You will have a fun little pile of triangles. Now it is on to sewing. Once again, sew a 1/4" seam along your pinned edge. Make sure to remove pins as you go and to double check your seams that they are laying flat by running your finger underneath the seam right before you sew across it. Continue to chain stitch all of your Disappearing 16 Patch Blocks. Now, this step is not necessary but only takes a second and I like to do it to reduce bulk. Along the corners of the inner squares there will be a small triangle that is "hanging out". (The little red plaid one) I like to clip these out in all four of the corners. Once again, not necessary, it just reduces bulk. Lastly, turn over your block over. You will have 4 little triangles sticking out from the center seam. Go ahead and clip them even with the block. Repeat for all 4 edges. Visually, these look made from 5.5 inch squares, is that correct? I LOVE this! Such a cute, and simple idea! I'm off to sew now!! Going to cut my blocks now, I'm not the best cutter. yikes! Oh, I like that...thanks for posting the idea and photos! Guess I'll join in the fun! I'll choose my fabrics and cut squares tonight and sew them tomorrow! Ahh coolness! I am looking forward to the challenge of more randomness! just sanity check - we should have left over triangles once we make the required number of new squares, right? I mean we cut each 16 patch square into 4 triangles and then use two of those to make one new square. Or did i miss something? Oh, I'm loving this! I just haven't started yet! LOL Still trying to finish up a baby quilt (that I keep messing up) and keep up with my pastor's-wife duties during a busy month. Hopefully I can jump in on Thursday . . .but I'm making no promises! Ugh! You will only have 2 leftover triangles if you are doing an odd number of blocks. There is a new chart at the top of this post to let you know how many disappearing 16 patch blocks you need. it is different than the 16 patch blocks. Wow, can't wait to get to this! I am wondering if at the beginning of each post in the quilt along you would put a link to the previous post in the quilt along and a link at the end of the post to the next post in the quilt along (adding it after it is written, of course). This would make the quilt along instructions handier as time goes by and the posts are older. Hi Melissa - i just figured it out, apparently i should never try math... i cut 10 16patches into 40 triangles BUT sew them back together into 20 new squares....apparently i missed the last step...i was sitting there thinking and it suddenly hit me... :) sigh...tomorrow hopefully! :) Thank you for your patient answer! I was busy sewing my 16 block squares together when I had a wee hiccup; or rather the earth did. Although we have power now, my quilt is on hold for a wee bit as the earthquake has made other things more important. Holay Smokes Rachelle!!! I am so sorry, I hope everyone is okay. Hopefully the recovery won't be long for you. We've been lucky, minimal damage to our home and all family is safe and well. Unfortunately many others are not so lucky. We have power and water, though we're on boil notice as the sewerage system is broken. Might be months before that's fixed. We thought the September earthquake was bad; ignorance was definitely bliss. This is not a good experience. I have always sewn by nesting seams and had them line up nicely. Open seams are challenging me. Any pointers? Yours look so good. I know there has to be a better way. I like to nest seams a lot as well. We are doing open seams in this quilt to help reduce bulk build up. The best way to get your points right on is to pin, pin pin :) I pin even when I am nesting my seams. It ensures nice lined up points. It has been a good day! Before dinner I had all the blocks sewn back together!! I love it so far. Can't wait to finish it! Some one just told me about this block. So So Cool. I think I am going to make one. Just wanted to pop in and say thanks. Hi Melissa, So pleased this tutorial is still available - I was looking for a special quilt to make for a friend who's having a challenging time right now and hopefully this will bring her comfort for now and for what will hopefully be the most beautiful chapter of her life to come. Thanks again for your clear, easy to follow instructions. I've never, ever pinned.....looking at all the joins in this quilt I decided to completely follow your instructions and press my seams open...my usual method of lining up joins - pushing, pulling and praying - wasn't going to work with open seams as it pulled open the fabric....I've been pinning and have been so pleased with the results! [Well, there's salvage and there's just plain bad cutting that can't be salvaged, but what can you do - it's made with love! ;) ] So, again, thanks so much for continuing to make your great tutorial available! I'm using a limited number of Fandango fabrics and a Michael Miller(I think) 'Baby Talk in aqua spots for my sashing pieces..... Loving the look so far! I'm extremely impressed with your writing skills as well as with the layout on your weblog. Is this a paid theme or did you customize it yourself? Anyway keep up the excellent quality writing, it's rare to see a nice blog like this one nowadays. Have you ever used a quiltersslidelock for cutting your pieces? Go to www.quiltersslidelock.com to check it out. It is better than a yard stick. Sunkissed by Spring Is Here!! !